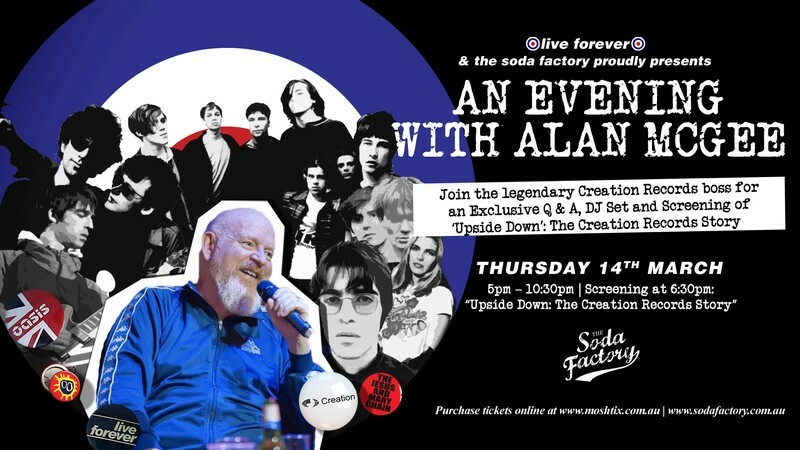 Join the legendary Creation Records boss, Alan McGee, for an exclusive Q&A, DJ Set and screening of ‘Upside Down’: The Creation Records Story. McGee’s role in shaping British musical culture over the past thirty years is hard to overstate. As the founder of Creation Records he brought us the bands that defined an era, including a now-legendary 1993 meeting in Glasgow with an as-then-undiscovered Oasis, who he offered a deal to on the night. The rest, as they say, is history and here’s your chance to hear it from the man himself. A charismatic Glaswegian who partied just as hard as any of the acts on his notoriously hedonistic label, he became an infamous character in the world of music. After leaving school at sixteen, he went on to set up the Living Room club in London (which showcased many emerging indie bands), managing the Jesus and Mary Chain and co-founding Creation Records when he was only twenty-three. His label brought us acts like My Bloody Valentine, House of Love, Ride and, of course, Primal Scream and Oasis. Embracing acid house, Alan decamped to Manchester and hung out at the Hacienda, and took Creation into the big time with the release of Primal Scream’s Screamadelica. As he climbed back to sobriety after a drug-induced breakdown at the height of the 90s, he oversaw Oasis’s rise to become one of the biggest bands in the world, with Alan himself becoming one of the figureheads of Britpop. Join Alan as he talks all things Creation & Rock N’ Roll in this up close and personal Q&A. Doors open to public at 10:30pm for a Soda party!